This past January at the Yankee Sportsman’s Classic, I spent quite a bit of time talking with Brian Bouchard and Leo LaBonte. Brian is the owner of Fields Bay Outfitters and Leo is both a guide and an award winning decoy carver. I will state up front that I am not a duck or goose hunter. My friends will state that I am not a deer hunter either, but the difference is that I do hunt deer…just not well. I have never hunted ducks or geese. In fact, I have never really wanted to hunt them. It was my understanding that you hunted ducks and geese in the worst weather and I couldn’t imagine having to shell (pun intended) out all the money for decoys and gear. I had approached Brian at his booth to ask him a couple questions I had about duck and goose hunting. One question led to another and Friday’s questions led into Saturday’s questions. Both Brian and Leo were very helpful and I am intrigued with the Fields Bay Outfitters’ business model. Who knows, maybe I’ll try waterfowling after all. Let’s start with waterfowling. Fields Bay Outfitters targets local sportsmen wanting to try waterfowling, but who don’t want to go out and invest the money in all that they’d need – boat/canoe, insulated waders, a dozen or so decoys, etc. (new Lab puppy, training, chewed shoes and furniture, new hardwood floors and bathroom to bribe wife…that’s another story). Most local guides are looking for out-of-state clients to take hunting and fishing. Out-of-state clients aren’t likely to return to hunt or fish a guide’s local productive spots on their own like local clients might. Fields Bay Outfitters hunts on leased land where they hold exclusive rights. They can provide their local clients great hunting opportunities without the worry of returning non-paying hunters ruining productive spots for future clients. Fields Bay Outfitters provides local sportsmen with a perfect opportunity to “test drive” waterfowling at very reasonable rates. They also have a “no shoot, no pay” policy. If a client doesn’t have an opportunity to shoot at any ducks or geese, then the client does not pay. Note that this is not a “no hit, no pay” policy, so, sadly for some, poor shooting is not rewarded. Another interesting aspect of hunting with Fields Bay Outfitters is that most of their waterfowl hunts are conducted over hand-carved decoys. Most of these decoys are carved by Leo. The decoys are functional works of art. Leo’s decoys have each time they were hunted over written on the bottom. They decoys are for sale and make a wonderful souvenir of your hunt (particularly if you are taking your one of your daughters, say Katie or Maddie, on their first hunt). 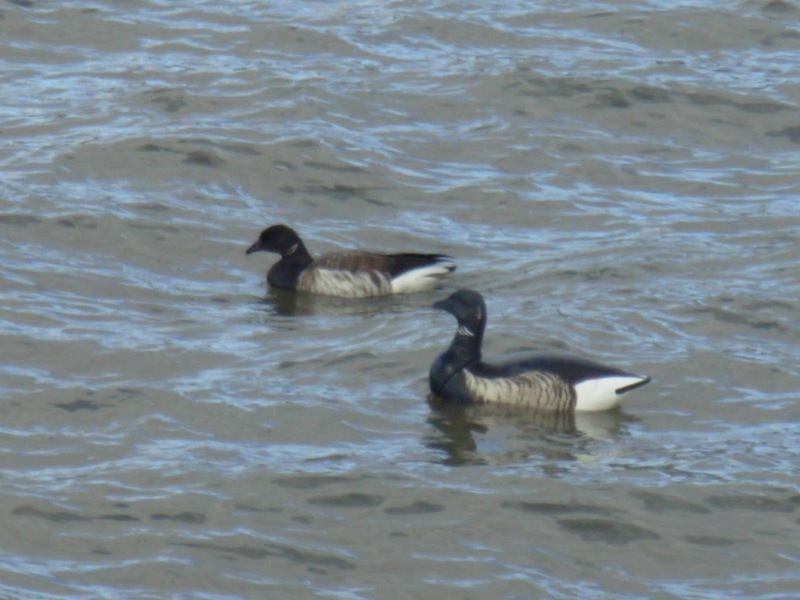 Speaking of decoys…. While I’ve never hunted ducks or geese, even I have a decoy or two in my house. My first decoy was inherited from my pépère (grandfather). Others were acquired later. I understand from Brian and Leo that collecting decoys can become an obsession. Brian even has his mom and aunt on the look-out for decoys at garage sales. I was very impressed with Leo’s decoy painting. It showed great attention to detail. I asked Leo about how he went about learning to paint decoys. Leo said he has spent countless hours trying different techniques to get the painted feather texture just right. His feather color is determined by painting on actual feathers to match the colors perfectly. While I’ve focused on waterfowling, Fields Bay Outfitters also offers turkey and predator hunts. Information about hunts, as well as contact information, is found on their web site, http://www.fieldsbayoutfitters.com/. As I’ve mentioned previously, I’m a gadget guy. I asked Brian what gadget he found to be most useful in the field. iPhone was his immediate reply. He uses his iPhone to get wind and weather information, to access social media, to take pictures, and to scan credit cards. He then told me of a picture of him that was taken up in Canada using an iPhone that was a final contender in a photo contest (left). 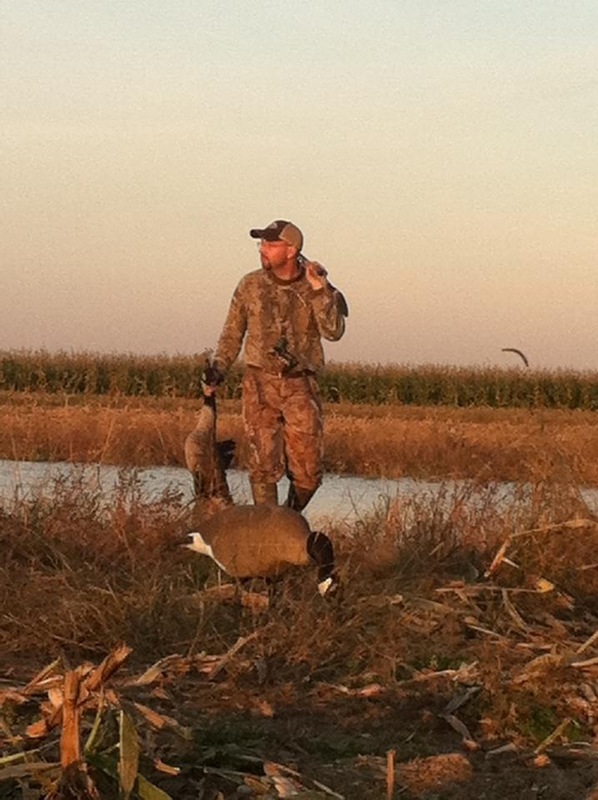 This photo and many others can be found on the Fields Bay Outfitters’ web site. I am definitely planning a hunt with Brian and Leo in 2013. It’s just up to Katie and Maddie to pass a hunter safety course and get their hunting licenses. I understand that there is even a paternal figure in their life, that writes a blog, whose first name begins with K, who will finance this endeavor. And what young lady doesn’t look great in camo?